You have been awarded patent protection for your invention. But that doesn’t account to the fact that work to safeguard such invention is over. You still have a great deal of things to handle. Such as maintaining your right over the patent, you have filed with the patent office. The only way of managing such right over the patent is through submitting the patent fees with the patent office at the time of renewal. Patent renewal has to be done only after the patentee has been granted patent protection, but the same could take upto many years to be granted and hence the patent renewal fees will only be payable at the time of grant of a patent. 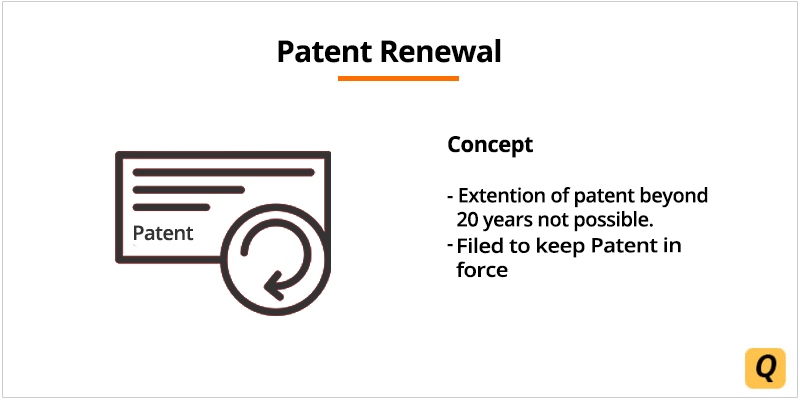 The renewal fees accumulate and then at the time when the patent protection is granted the entire patent renewal or maintenance fee is payable by the patentee. Remember once you have paid the patent renewal fee for the first 2 years the patent then will have to be renewed for every consecutive year thereon. A patent is granted for a period of 20 years and no further application can be filed to extend such protection beyond that time. But the issue that remains in hand is that even if the patent cannot be protected for a period more than 20 years it needs to be maintained to keep the protection in force. And as an inventor, you should definitely see that patent grant remains in force throughout its lifetime i.e. 20 years of protection that is granted to any invention in India. Take for Instance you applied for patent protection on April 10th 2008 and you were granted patent protection December 10th 2015. This would mean that the patentee whether a corporation or an inventor himself will have to see that with the grant of protection certificate from the government they submit the renewal fees. Here the inventor had to pay the renewal fee on 10 April 2010 but since the patentee was not granted patent protection till then the renewal fee kept on accumulating and had to be paid at the time of grant of a patent. The Indian government has granted certain rebates for the filing of intellectual property to specific entities such as Small companies and any single proprietors. Hence the renewal fees will vary based on the type of the entity represents himself at the time of applying. For instance for Individual and a small entity, the first renewal fees are Rs 800 and Rs 2000 respectively whereas for any corporation it is Rs.4000. Patent renewal for your invention can be obtained only after you have paid the renewal fees and it has to be paid every succeeding year after the patent renewal application has been filed in the second year. The patentee has a 6-month window for payment of the renewal fee. To see to that the patent doesn’t lapse the patentee has to provide with additional cost on the patent renewal which will increase every month based on the type of entity and the mode of a patent. Next Article What were the key highlights of the 34th GST Council Meeting?